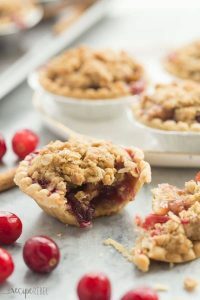 These Mini Cider Spiced Cranberry Apple Pies are so perfect for fall — I make them in pre-made tart shells for an easy holiday dessert that will impress your guests! *This post is generously sponsored by Tenderflake — thank you for supporting the brands that help me bring you these tasty, holiday treats! I have to admit, I was a little shocked with the popularity of this Cranberry Apple Cider from last fall. I can’t blame you for loving it — the cranberry apple combo is one of my favorites! For me, as a self-professed tea hater, apple cider is like everything good about tea without the actual tea. A warm, soothing drink for cold days, filled with tons of fruit flavor and just enough spice. I definitely wanted to recreate the drink into a more solid form — and this Cider Spiced Cranberry Apple Pie (in mini style!) was born! It’s loaded with apples, cranberries, cinnamon, nutmeg and topped with a crunchy brown sugar streusel (because what’s better than streusel?!). I love to make them in pre-made tart shells for an easy holiday dessert that’s perfect for potlucks! individual desserts are so much easier because there’s no need to slice or serve — they are ready to go once you put them out. Family and friends can grab one (or two… or three…) and go! Another thing I love about these? You can make them completely ahead of time and freeze. I got this idea from my mom and my grandma, who would often set aside just to make a pile of apple pies in the fall. They would freeze them both before and after baking, and both work just as well! For me, that’s a big thing in the midst of holiday chaos. Make ahead takes so much stress out of Thanksgiving and Christmas gatherings and potlucks! *Be sure to visit Tenderflake.ca and follow Tenderflake on Facebook, Pinterest, and Twitter for more recipe inspiration! 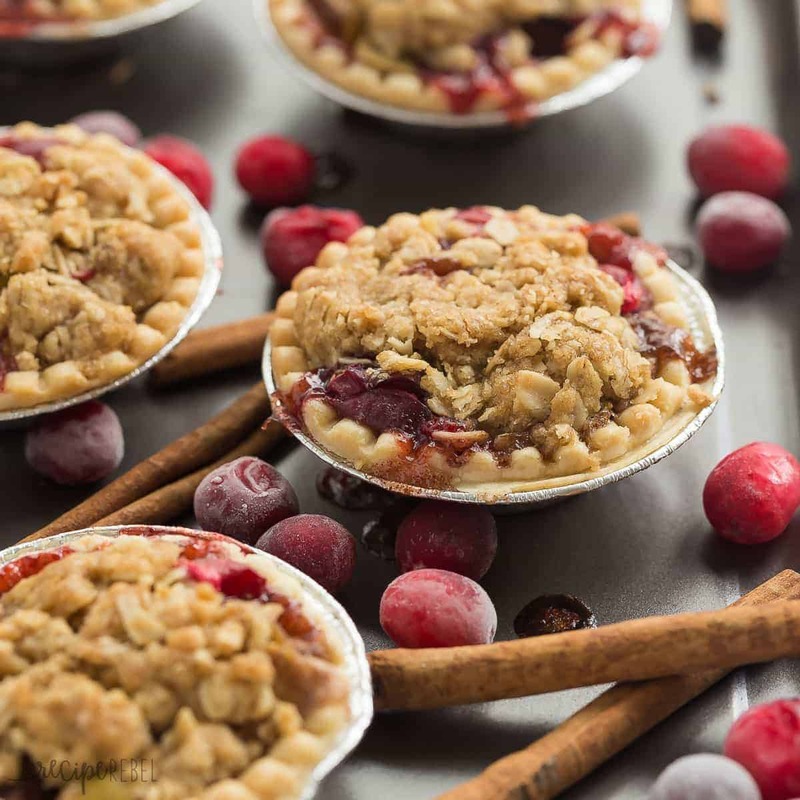 Mini Cider Spiced Cranberry Apple Pies is so perfect for fall -- I make them in pre-made tart shells for an easy holiday dessert that will impress your guests! Place tarts on a baking sheet (line with parchment paper for easy clean up!) and preheat oven to 350 degrees F.
In a large bowl, stir together apple, cranberries, 1 tablespoon flour, granulated sugar, cinnamon and nutmeg (a little or a lot depending on how much spice you like). Spoon fruit into unbaked tart shells -- I piled it high and got 12 tart shells, but you could easily get a few extra if you leave a little more room. StreuselIn a large bowl, cut together butter, brown sugar, oats and ¼ cup flour until cookie dough consistency. Gently press streusel onto tarts and bake for 26-30 minutes, until golden brown and filling is bubbly and thickened. *I used frozen cranberries so that the recipe is accessible year round. You should be able to substitute fresh cranberries for the frozen if you reduce the flour to 1 teaspoon, but I haven't yet tried it. 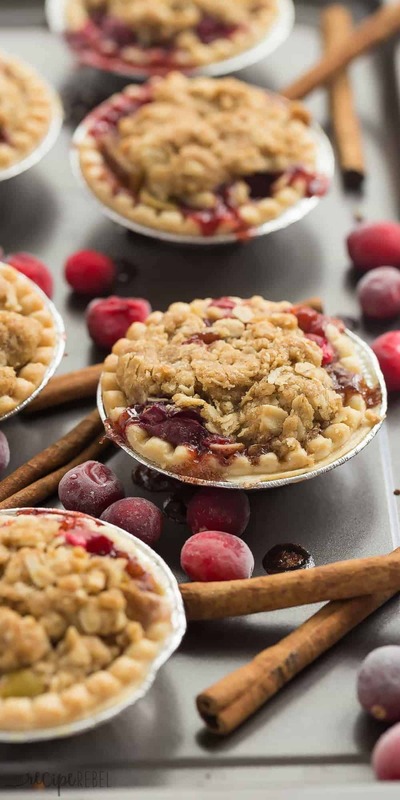 Mini Cider Spiced Cranberry Apple Pies is so perfect for fall — I make them in pre-made tart shells for an easy holiday dessert that will impress your guests! Spoon fruit into unbaked tart shells — I piled it high and got 12 tart shells, but you could easily get a few extra if you leave a little more room. In a large bowl, cut together butter, brown sugar, oats and 1/4 cup flour until cookie dough consistency. *I used frozen cranberries so that the recipe is accessible year round. You should be able to substitute fresh cranberries for the frozen if you reduce the flour to 1 teaspoon, but I haven’t yet tried it. These look perfect for bringing to a holiday party! Do you think they could be frozen after baking? Or would it be best to freeze and bake the day of? Thanks! Wow I totally missed the paragraph where you answered exactly this ha. Can’t wait to try these! Haha, no problem! I hope you enjoy them! Do you combine the cranberries as frozen? With the apples at room temp? And that’s not a problem with the filling baking consistently? Thanks! If you freeze before baking does that change the baking time or do you need to thaw first? You should be able to bake from frozen, but you will need to add to the baking time. I would just add 5 minutes to the baking time and watch carefully after that. This recipe looks so easy and imagining the end product makes my mouth water just thinking about it. I do have a couple of questions, though. 1. Where does “cider” enter this recipe?. There is no liquid at all mentioned in the directions. Was this an accidental omission or does the combination of ingredients provide a “cider” flavor, hence the name of the dish? 2. If the pie-crust type tart shells are unavailable, are fillo shells a viable substitute? They are “cider spiced”, so inspired by the flavors of cider which come through because of the spices. No omission 🙂 As far as phyllo shells, I’m honestly not sure how they bake up as I’ve never used them before. If the baking time is similar to pastry and they won’t be overcooked by the time the fruit is done, then it could work fine. I hope that helps! Are these supposed to be served hot or cold? I want to make them ahead and take them to a family Thanksgiving but I’m not sure if I can do that if they are served hot. Can you give me some advice on this? Ashley, I love these mini cider spiced cranberry apple pies!! 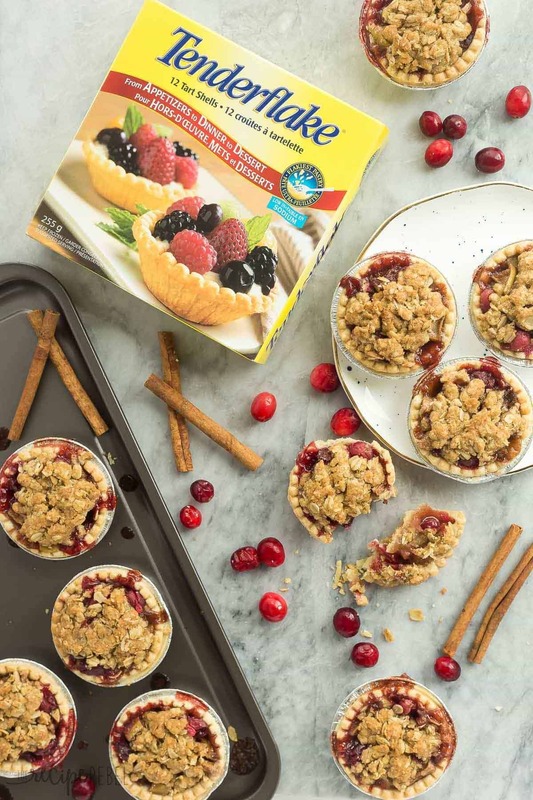 Nothing wrong with pre-made tart shells for an easy holiday dessert!!!! love it! 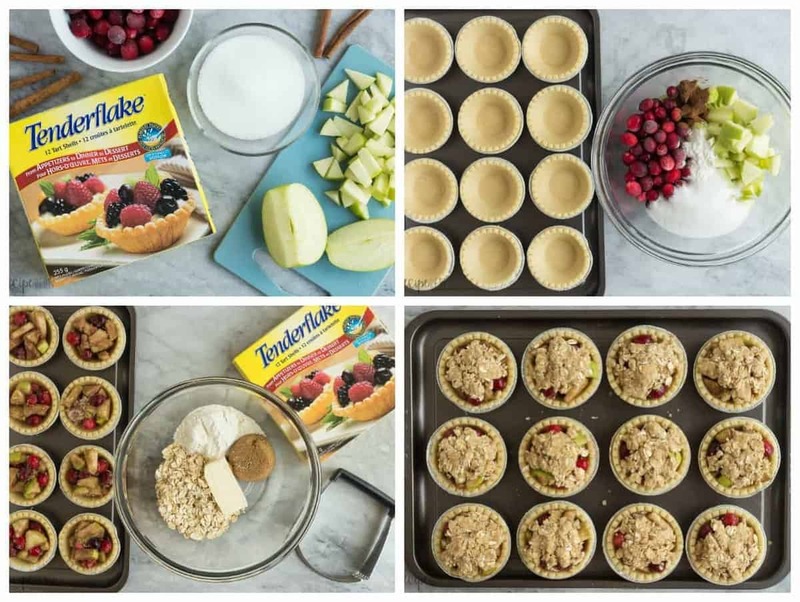 Those mini tart shells would be a total life saver, and I love the apple-cranberry combination! I know I wouldn’t be able to stop eating these! These mini pies are just the cutest, Ashley!! I love the cranberry and apple combo! So perfect for the holidays and that streusel topping is just calling my name!! Thanks Kelly! One of my favorites! Hi Ashley! I do like self serve desserts! The combination of apples and cranberries is perfect. I am going on a search for the pastry shells. Thanks Dorothy! I love apple and cranberry together too! Oh my goodness, these little pies are BEYOND adorable, Ashley! And since they’re so tiny, I can totally grab two right?? Dying over how cute these are! I’m picky when it comes to tea, but I LOVE cider! And I’m loving your mini pies, Ashley! These cranberry apple cuties look SO good! I don’t think I’ve ever had this mashup before, let alone in hand-held version. What a fun dessert to serve for the holidays!